Wachovia was the name used to designate a large tract of land in the northern Piedmont of North Carolina purchased by the Moravians, or the Unity of Brethren, from John Lord Carteret, Earl Granville, in 1752. 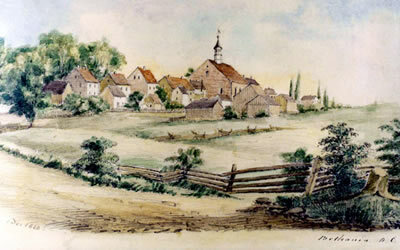 Moravians from Pennsylvania and from Europe settled the tract in the decades following, building the villages of Bethabara and Bethania, the town of Salem, and the rural congregations of Friedberg and Friedland. The Unity of Brethren (Unitas Fratrum) arose in the areas of Eastern Europe known as Bohemia and Moravia (presently the Czech Republic) after the martyrdom of Jan Hus in 1415. These Christians believed in a strong biblical foundation for faith, experiential religion, and evangelical preaching of the Christian message. After enduring persecution in the ensuing centuries, in 1727 some remnants of the faithful were given asylum on the estate of Nicholas Ludwig, Count von Zinzendorf, in Saxony, north of Dresden. From their communal village named Herrnhut, Moravian missionaries traveled throughout Western Europe and to the New World to establish Bethlehem, Nazareth, and Lititz in Pennsylvania. Organized on economic communalism, these towns quickly stabilized and spawned yet other communities. Count Zinzendorf, now an ardent Moravian, learned of available land in the royal colony of North Carolina. Earl Granville, a descendant of one of the original Lords Proprietors, had declined to sell his share to the Crown in 1729. Therefore, while North Carolina was a royal colony, Granville controlled a large territory on which he hoped to settle prosperous colonists. Moravians saw an opportunity to acquire a large piece of land where they might work and worship in peace, with the Crown and the church providing security from oppression. In 1752 agreement was reached in principle for the Moravians to purchase a significant tract in the northern sector of the colony. Granville's eastern North Carolina lands were mostly settled, but surveyors accompanying Moravian August Gottlieb Spangenberg located a tract of 98,985 acres on the three forks of Muddy Creek, east of the Yadkin River in what is today Forsyth County. Upon viewing such bountiful territory of hills and valleys, Spangenberg was reminded of a beautiful ancestral estate of Count Zinzendorf in south Austria near the Danube, which was named Der Wachau. He suggested that the North Carolina tract be named to honor the Zinzendorf family for its assistance to the Moravian survival and resurgence. Both Wachau and the Latin form, Wachovia, were used by Moravians to refer to their North Carolina land and the developments therein for a hundred years. Only in the 1850s, when Wachovia land was sold to non-Moravians and the new county seat of Winston was established adjacent to the northern boundary of Salem, did the distinctive Moravian term diminish in usage. Wachovia remains associated with its Moravian heritage and is familiar to citizens of Winston-Salem. But for most North Carolinians, it is recognized as the name of a prominent banking interest, Wachovia Corporation, which traces its roots to 1879, the year the First National Bank of Salem moved to nearby thriving Winston and became the Wachovia National Bank. Fries, Stuart T. Wright, and J. Edwin Hendricks, Forsyth: The History of a County on the March (1976). "Wachovia Tract Before Salem." Photo courtesy of the Wachovia Historical Society. Available from http://www.wachoviahistoricalsociety.org/events/upcoming.html (accessed May 2, 2012). 1 January 2006 | Surratt, Jerry L.
Thank you for visiting NCpedia and for sharing your question. Could you also tell me that map you were looking at, for reference? Moravian Falls is a community and waterfall in Wilkes County, NC. According to the NC Gazetteer, the area was named by Moravian surveyors in the 1750s. I do not know if it was, in an way, part of the original nearly 100,000 acres aquired by Moravians for settlement in North Carolina. You may want to consult a number of records, including those at the State Archives of North Carolina, where you might locate the original deeds, historians and archivists at the Old Salem historical site in Winston-Salem, as well as the historical publication Records of the Moravians in North Carolina. This multi-volume publication, along with other related publications, has been digitized and is available online. And I think the Old Salem historical site would be a very good resource as their historians and archivists will have the best knowledge of the history of the settlement.